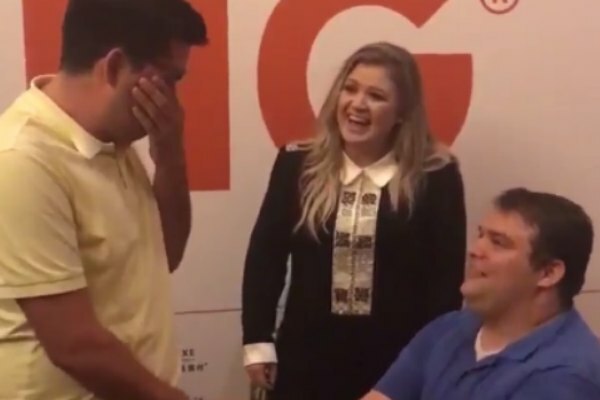 Singer Kelly Clarkson helped a man surprise his boyfriend with a marriage proposal. Alex Malerba proposed to his boyfriend during a recent meet-and-greet at The Venetian in Las Vegas, Nevada. Clarkson cheered as Malerba got down on one knee. “HE SAID YES!!!! THANK YOU @kelly_clarkson !!!! !,” Malerba said in sharing video from the proposal on Twitter. In comments to Entertainment Weekly, Malerba explained how he recruited Clarkson to be a part of the proposal. "After all this it has been incredible and of course we hope she would attend the wedding!! We love her. … Also, it was months of savings to purchase the perfect Tiffany wedding ring to make sure he knows how much he is worth it to me!" Malerba called the experience “amazing.” “All the love from friends and family has been overwhelmingly positive,” he said.